Evolving since the 1870s, the library has become an important part of our community. In the years around the middle of the 1870’s Winterset had 18 lawyers, 16 doctors, 4 hotels, 16 churches and 2,400 residents. Some citizens were concerned about the young men and women of this community at a time when the temperence movement was being revived. It was decided to establish a library where young people, especially the young men, could have a place to read and meet as friends. Business men collected money and invested in 100 books. The Young Men’s Christian Association was to keep the books and loan them to readers. This arrangement did not work out. The books were given to the Women’s Christian Temperance Union to care for and loan to readers. The rooms where the books were kept for loan were known as Reading Rooms. One of the first rooms was tended by C. Schwaner, a harness dealer, who gave the use of two front rooms on the second story of his new building on E. Court Ave (second building from the intersection of Court Ave and John Wayne Drive) rent free for one year. Interested persons gave tables, chairs, lamps, books and stoves to equip the rooms. Some of the donors were J.S. McCaughan, a lawyer; Dr. D.C. Bevington, a livestock dealer, realtor and president of National Bank of Winterset; and Reverand Henry Wallace, a Presbyterian minister. The North wing of the top floor of the courthouse was also a Reading Room until 1855 when the Women’s Christian Temperance Union disbanded. Following the disbanding, the County Superintendent of Schools, E.R. Zeller, took and cared for the books for four years. Rooms again had to be secured in 1889 as the number of books kept growing. The new Reading Rooms were on the second floor of a building on the west side of the square owned by S.E. Catterlin, a harness maker. Today we know the building as Security Loan & Abstract Co.
Around this time Mary Cassidy expressed interest in helping to found a library. She was appointed Librarian in 1891 and served the library for almost 30 years. Her first home for her library was probably in S.E. Catterlin’s building. Colonel Cummings, a lawyer, landowner and editor of the Madisonian erected a new building at 110 W. Court Ave (where Clark’s TV now resides). This new building was leased to the library and the books were moved there in November of 1900. Since 1891, there was evident interest in a permamnent library building. The city voted a permanent library, supported by the city and a tax levy for maintenance. This was accepted by the Council and the first library Board was orgnized in 1894. In the late 1800’s and early 1900’s, Andrew Carnegie was distributing money at home and abroad for 1500 libraries. 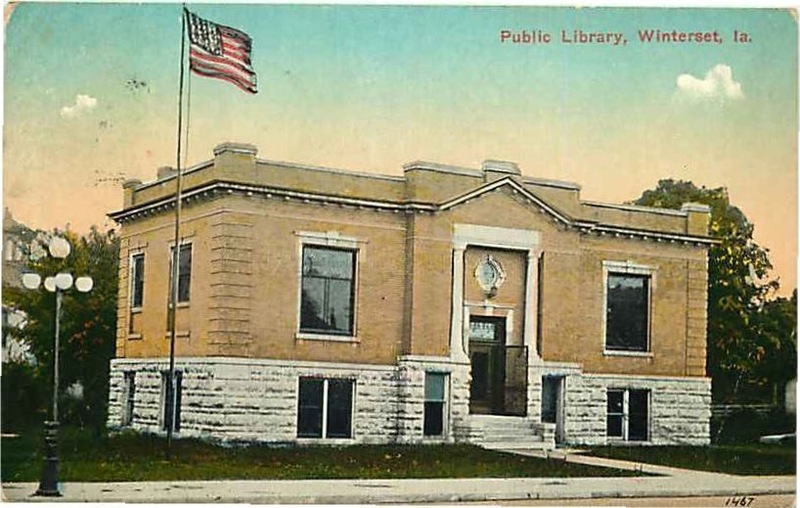 At this time, Indianola, Iowa had a Carnegie library, so a letter was written to Mr. Carnegie and an answer dated February 11, 1904 came to the Library Board of Trustees. The children of C.D. Bevington, S.G. Bevington and Mrs. L.M. Alexander gave 66 feet for the site of the library. It was decide a few years later that more land would be needed for the size of the building. The city bought 1/3 lot joining on the east of the Bevington land from Cummings for $1300. The Bevington family stipulated that a proper memorial be placed in or on the building. In 1991, the Library Board placed a bronze plaque near the North entrance. Construction of the library began in 1904. The first seven feet above ground was made of native stone finished in pitch face. This stone came from the ground of the first stone courthouse that burned in 1875. Workmen removed the foundation stones of the fence formerly around the courthouse yard, cleaned them and carried them to the library site. The library opened on June 16, 1905. The building to longest serve Winterset as its library now serves as city hall. Lincoln Township began contracting for use of the libary in 1916. 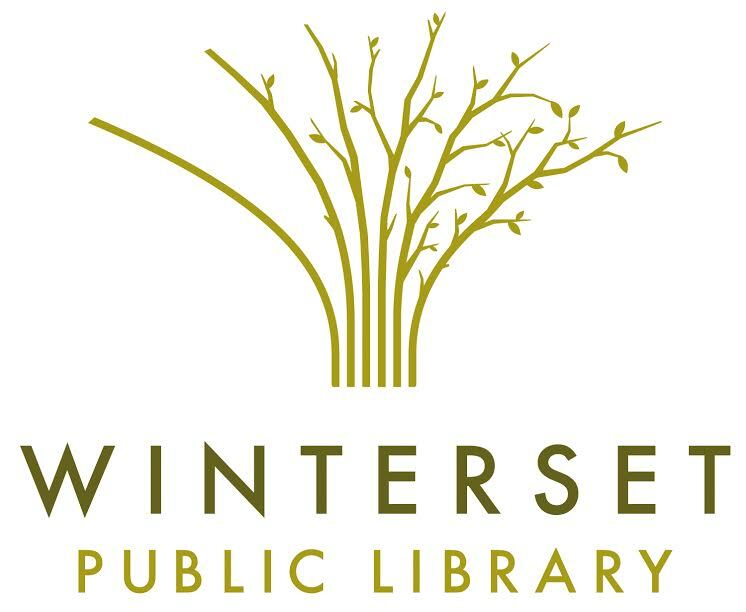 Gradually thereafter, other townships and towns signed contracts to use the Winterset Public Library. During the depression in 1933, when people could not pay their taxes, there was no librarian for one month. Members of the Board took turns keeping the building open for reading purposes only. The city refused to pay for lights, the telephone was removed, shorter hours took effect, the Librarian’s salary cut to $50 a month and there was no extra help and no assistant librarian. The Estate of Martha Crawford gave the library a carrara marble statue and base in 1943. Martha was the wife of A.W. Crawford who, with his brother and father, was in the grocery business in Winterset and later delved in real estate and abstract business. After his retirement, he and Martha travelled extensively in Europe and the Holy Land. This status, no doubt, was purchased during one of those trips. Italy is famous for carrara marble. Friends of Daniel J. Gallery, who died in 1964, gave money to landscape the grounds. Mont Johnson furnished and placed a plaque in his honor at the North entrance of the building. Library activities grew throughout the 50’s, 60’s and 70’s. More space was needed and serious talk about renovating the basement began. Representatives of the library drove to Mason City in October of 1978 to meet with the trustees of the Kinney-Lindstrom Foundation and ask for financial help. It bore fruit; the library was given $15,000 – a great help to the total renovation costs which totaled $25,256. Other help came from the Kitty Griffen Fund ($1,500), Masonic Lodge ($7,437) and proceeds from public auction of some of the old library furniture ($4,379). If you are interested in more history, visit the Iowa Historical Society.